Dry eye is a dehydration disease with multiple causes. New Research is discovering causal links between dry eye and age, hormones, eyelids, the environment and more. Dry eye causes are multiple, complex and still not completely understood. Because of the rapid worldwide increase in dry eye disease and other dehydration diseases, especially severe chronic dry eye, tear film research discoveries are now isolating the physical, demographic and environmental causes of this potentially sight threatening and life threatening condition. 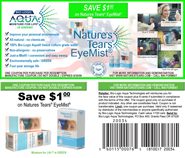 Nearly everyone experiences occasional, transient dry eye and tear film water loss. It is estimated that 40 million Americans suffer from dry eye disease or dry eye syndrome. Dry eye symptoms are the #1 reason for eye doctor visits in the United States. Worldwide, dehydration disease, tear film water loss and dry eye causes impaired eyesight, preventable blindness and even death. This is especially true countries where medical facilities are poor, dry air is a problem, water is scarce or unsafe and air pollution is far worse than in the United States. Environment: We are frequently surrounded by dust, pollution and low-humidity air (dry air) that irritates and dries the surface of our eyes. Insulated walls and windows, and forced-air heating and cooling also expose us to dehydration. These environmental factors and resulting water loss create surface inflammation on the eyes and skin, and also contribute to ocular allergies, sending hormonal messages to the tear glands. Continual low-grade trauma may cause the continued sending of these hormonal messages and thereby worsen the condition. Age: Tear production gradually decreases with aging and at some point this could induce dry eye symptoms. The exact mechanism is unclear and may relate to other factors described herein. Evaporation: The ocular surface would be completely dry were it not for the protective lipid (oil) layer produced by the eyelids' meibomian glands that seals in the underlying water. In a normal eye, only a small percentage of tears evaporate but when dry eye is accompanied by meibomian gland dysfunction (as is often the case), evaporation can increase to nearly the total amount of tears produced. Hormonal flux: The primary hormone thought to influence tear production is testosterone. Estrogen and androgen may also play a role since the lacrimal gland possesses both estrogen and androgen receptors. Lactating women, who have elevated levels of the hormone prolactin, often show decreased tear production and increased dry eye. Contact lenses: Dry eye is a frequent side effect of contact lens use, and discomfort from dry eye is the most common reason for discontinuing contact lens use. Tear film evaporation definitely increases while wearing contact lenses, possibly as a result of feedback between the ocular surface and lacrimal gland. Menopause: Although menopause does not appear to cause dry eye, there is an interaction between hormone replacement therapy and dry eye. Originally it was assumed that estrogen replacement would help dry eye symptoms, however research found this was not the case and estrogen with progestin (a synthetic hormone) actually makes dry eye worse. LASIK: LASIK surgery to correct vision often induces dry eye. This usually temporary but occasionally severe condition has been attributed to loss of stimulation due to cutting of the corneal nerves during surgery. A preferred explanation suggests that corneal trauma inhibits the feedback mechanism between the ocular surface and lacrimal glands. Autoimmune: Sjogren's syndrome is an autoimmune disease characterized by lymphocytic ("lymphocyte": white blood cell originating in the lymph system) infiltration of the lacrimal and salivary glands. Three criteria are required for diagnosis of Sjogren's syndrome: dry eye, dry mouth, and the presence of some other autoimmune disease. Ten-percent of chronic dry eye patients show symptoms of Sjogren's while a much larger percentage show some element of autoimmune disease.